"Britain is better off inside a reformed EU", so says David Cameron. There's every possibility that he's right of course, we'll just never know because a reformed EU isn't even remotely on offer. Preceding this referendum, the PM embarked on a renegotiation with European leaders in an attempt to get better terms for the UK's membership of the European Union. Back in 2013 when Cameron gave his Bloomberg speech in which he promised this referendum, he also set out what he saw as the issues with the EU and what areas he wanted to reform. The PM spoke of the growing frustration of the EU, with it seen as something done to people, rather than something acting in their interests, with decisions taken further and further away from them. He spoke of how the EU "must be able to act with the speed and flexibility of a network, not the cumbersome rigidity of a bloc. Not weighed down by an insistence on a one size fits all approach." He acknowledged that there was no European 'demos', and that "power must be able to flow back to member states not just away from them. It was promised by European leaders a decade ago. It was put in the treaty but it has never been properly fulfilled." After winning the election, Cameron was given a mandate to go and seek those reforms. On the Marr show in January last year he affirmed his ambition for wide-ranging 'full on' treaty change. The Bloomberg speech also mentioned exemptions for small businesses from EU directives, changes to the working time directive and repatriation of social and employment law - the latter a 2010 manifesto pledge. But with every subsequent reveal it appeared that he was asking for less and less from our European partners. All those exemptions he'd mentioned at Bloomberg were dropped from his negotiations. He didn't even ask for them. Cameron made no attempt to reform free movement, instead opting to focus on in work benefits for migrants. This seemed to be somewhat of an own goal as prior to making it a flagship proposal of his renegotiation it was an issue that barely anyone mentioned. The Conservative manifesto said: "We will insist that EU migrants who want to claim tax credits and child benefit must live here and contribute to our country for a minimum of four years." It also proposed a "new residency requirement for social housing, so that EU migrants cannot even be considered for a council house unless they have been living in an area for at least four years". Cameron also wanted to prevent EU migrant workers in the UK sending child benefit or child tax credit money home. "If an EU migrant's child is living abroad, then they should receive no child benefit or child tax credit, no matter how long they have worked in the UK and no matter how much tax they have paid." Cameron had to compromise on the welfare aspect of his renegotiation quite considerably. The four-year 'emergency brake' on in-work benefits wasn't so much an 'emergency brake' as a light feathering of the throttle, with benefits being phased in over the four years. Cameron failed in his original demand to ban migrant workers from sending child benefit money back home. The final agreement Cameron secured mentioned no changes to social housing entitlement as they were yet another area he'd dropped before preliminary negotiations began. So he went from seeking wide ranging reforms and full-on treaty change, to requesting a minor tweak in welfare provisions for EU migrants and even then he had to compromise on that. The vague semantic changes he's been promised about 'ever closer union' and a proposal to reduce the regulatory burden are so vague as to be inconsequential. Moreover, these changes haven't come into force yet, with the PM merely stating that the commitment to these reforms is legally binding. This itself has been shown to be completely false. So there's no guarantee that the pitiful reforms Cameron did manage to secure will ever come into force anyway. Of course, the fact that the renegotiation has all but been dropped from Remain campaign literature belies how insubstantial it is. Despite this, there's an overarching argument from the In camp that the EU isn't perfect, but we should stay in anyway to help reform it and change it. But if all we can secure is a minor tweak to welfare - itself not guaranteed - when one of it's largest members is threatening to leave, how can we possibly expect to enact the sort of reforms Europhiles claim they want once we've voted to remain fully committed to the project? Indeed, there's evidence to suggest that we could in fact exert greater influence for reform from outside the EU. Australia, by building coalitions on international forums managed to secure greater reform to the EU's CAP than any member state has managed from within. There have been numerous calls for reform throughout the EU's history, yet it has still marched inexorably onwards towards it's stated goal of federalisation. Because of course none of this means that there won't be changes in the EU. 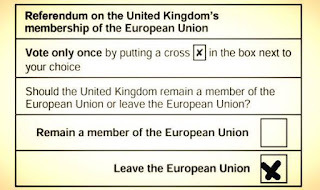 This referendum is not a vote between leaving and maintaining the status quo. There are clear plans to continue towards full political and fiscal union. The Five President's report details the steps to be taken over the next few years to complete this amalgamation. Whilst mainly dealing with the Eurozone, there are several areas in which it specifically pulls in all 28 members, both Eurozone and non-Eurozone countries, particularly in the area of fiscal and banking union. And then, on top of this, there's the talk of tax harmonisation across the Union, as well as a consolidated EU military force. 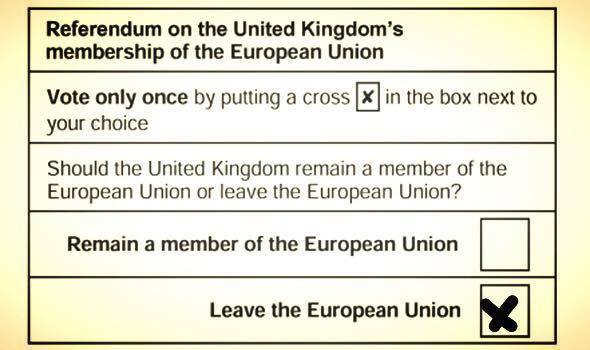 There's no such thing as a qualified Remain vote. Brussels will take a UK vote to stay in the EU as an endorsement of these plans. Given that they're being talked about openly, we cannot plead that we didn't know that that was what we were voting for. Plus thanks to Qualified Majority Voting, we're all but powerless to stop it. 70 times the UK has voted against EU legislative proposals, and 70 times we have been defeated. This is precisely why we should leave. We are on a fundamentally different path to our allies on the continent, and no amount of aspiration to reform the EU will change that.